In fact, the event of the Second Coming of the Divine Masters and the coming New Gospel from the Divine Mother are two aspects of one and the same mystery - the reality of the New Heaven and the New Earth coming into existence from God the Absolute, the Source of Life. The yellow axis, pointing to Polaris is the situation now. Note that when the celestial sphere is seen from outside constellations appear in mirror image. Also note that the daily rotation of the Earth around its axis is opposite to the precessional rotation. When the polar axis precesses from one direction to another, then the equatorial plane of the Earth (indicated with the circular grid around the equator) and the associated celestial equator will move too. Where the celestial equator intersects the ecliptic (red line) there are the equinoxes. As seen from the drawing, the orange grid, 5000 years ago one intersection of equator and ecliptic, the vernal equinox was close to the star Aldebaran of Taurus. 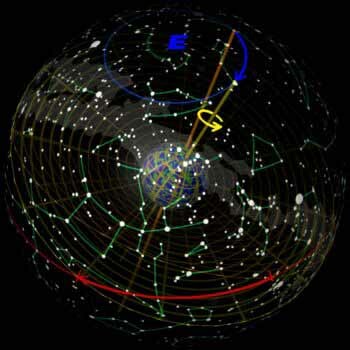 By now (the yellow grid) it has shifted (red arrow) to somewhere in the constellation of Pisces. Note that this is an astronomical description of the precessional movement and the vernal equinox position in a given constellation may not imply the astrological meaning of an Age carrying the same name, as they (ages and constellations) only have an exact alignment in the "first point of Aries", meaning once in each ca. 25800 (Great Sidereal Year).